USDJPY is under the influence of Japanese and the USA Central Bank meetings, the Great Britain referendum and also some economic reports in China such as the industrial production and retail sales. The pair has been moving with bearish bias falling down the descendant channel since the previous high at 111.452. 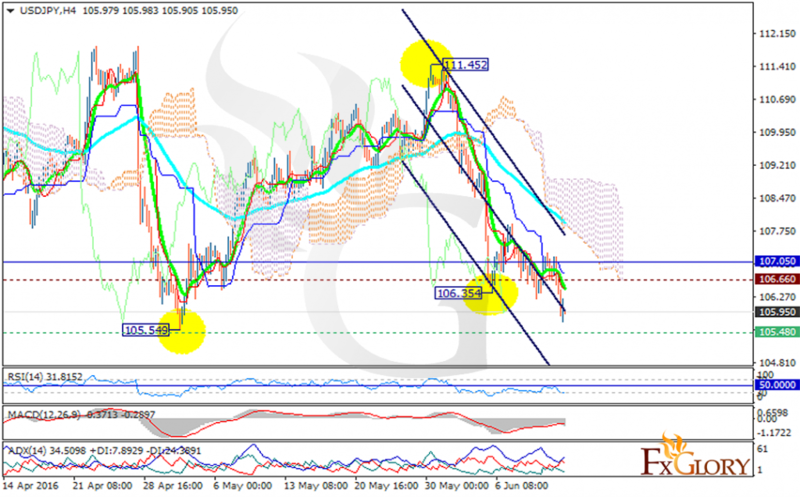 The support rests at 105.80 with resistance at 106.660 which both lines are below the weekly pivot point at 107.050. The EMA of 10 is located below the EMA of 75 and is falling down as well. The price is under the Ichimoku Cloud and the Chinku-span. The Tenkan sen and the Kijun-sen are both signaling price decline. The MACD indicator is in negative territory, the RSI is on oversold zone and the ADX is showing strong sellers. The resistance level breakout will push the price to higher ranges like 108.